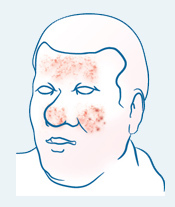 Some people with rosacea experience facial flushing with return to normal appearance between flushing episodes. Some with the condition have constant redness (otherwise known as erythema) across the nose and cheeks, and this redness may vary from the appearance of a light sunburn to deep, almost purple red. Others have red bumps, nodules and/or pustules (small abscesses that resemble pimples). 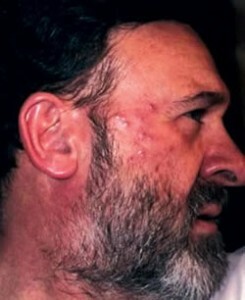 Still others have telangiectasia (small blood vessels that become visible in the skin; commonly known as broken veins). An individual can suffer with one or a combination of these symptoms. 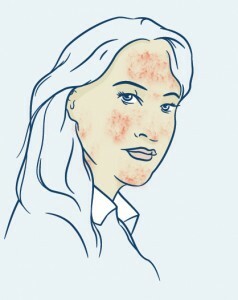 Though not considered life threatening, a survey conducted by the National Rosacea Society found that the condition caused nearly 70% of people to suffer low self-esteem and self-confidence, and almost half of people with rosacea indicated that it had a negative effect on their professional and social lives. This is not to say that rosacea cannot have serious medical consequences. 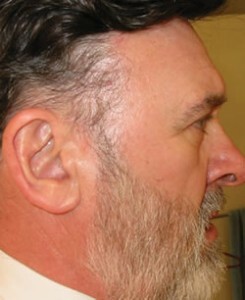 Rhinophyma, the enlarged deformity of the nose, can be a long-term consequence of rosacea and, once it develops, can only be corrected by surgery. Also, the ocular form of rosacea can result in blindness if not taken seriously. Unfortunately, we do not have a clear answer to this question. Like most chronic diseases of adults such as high blood pressure, atherosclerosis, osteoarthritis and diabetes, rosacea appears to be a multifactorial disease. Meaning it is caused by multiple factors with the combined effect resulting in the development of the disease. Fluid aspirated from rosacea pustules contains leukocytes and two types of bacteria (staph and propionibacteria). It would be tempting to think that these bacteria are the cause of rosacea. However, similar bacteria can also be found on the skin of many people who do not have rosacea. One possible explanation is that people with rosacea have an abnormal reaction to these otherwise normal skin bacteria. Another possibility is that the bacteria from rosacea-prone skin appear to be the same as the organisms from normal skin, but they may produce different inflammatory factors that cause an abnormal response in rosacea. One study showed that the staph bacteria isolated from people with rosacea produce inflammatory factors under increased temperatures such as may occur in skin exposed to the sun, hot weather or stress, all of which are known to bring on rosacea attacks. The fact that antibiotics have historically been the primary treatment for rosacea provides the best evidence that bacteria play a major role in terms of contributing causes. This also explains why the NRT products, which contain both antibacterial and anti-inflammatory marine extracts, are so effective in treating rosacea.